I had the privilege of working with him for a week in Kumasi when I was production advisor to the Moving Vision television company of the UK and which was filming for eight months, a panorama of the Kingdom of Ashanti. 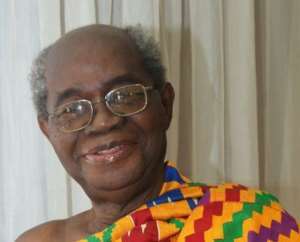 Together with the late Professor Albert Mawere Opoku (Professor Abena Busia calls the two- Mr. Music and Mr. Dance) they were the experts on the performing arts part and interpreted the dance movements and their historical evolution as the contracted dancers and drummers dazed for the cameras. Years later when Professor Adu Boahen passed-on, I went to see him at the Institute about a GBC television obituary discussion with the Nigerian historian, Toyin Falola and David Owusu- Ansah of James Madison University for a musical funeral dirge. He easily recommended Nkradae by Ephraim Amu the deep meta-philosophical lyric of his befriended mentor. He told me that at every point in time, every soul in one form or another would have to engage in Nkradae - a farewell gesture or departure announcement from the earth.